Federal surveys estimate that over 486,000 people seek emergency room treatment for burns each year in the United States. 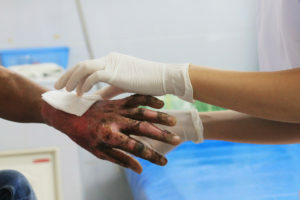 Globally, over 180,000 are killed each year by burn-related injuries. What happens when some else’s negligence causes a burn injury? Read on to learn more about these serious injuries and how you can financially recover from them. Burns are caused when the skin touches hot substances or a hot surface. These injuries can range from minor to life-threatening. Below are some of the most common causes of burn-related injuries. Statistics show most burn injuries occur while at home or work, and the other forms of burns are much less common. Along with the physical and emotional pain from your injury, it’s likely you’ll also suffer financially. Extensive medical bills, lost time from work and an extended recovery period are typical with serious burns. How will you pay these overwhelming costs? The circumstances surrounding your burn injury will dictate whether you can seek compensation through a lawsuit or not. Here’s a brief overview of where you can look for financial relief after a burn injury. These circumstances only apply when your burn was caused in part by some else’s negligence. If you need more information about pursuing a lawsuit, then it’s advised that you reach out to an attorney as soon as possible. Did you or a loved one sustain serious injuries due to negligence in New Jersey? Don’t let the medical bills pile up while you wait for the negligent party or their insurance company to do the right thing. Right now, you need an aggressive personal injury attorney on your side, fighting to get you the compensation you need, want, and deserve. The skilled attorneys at Rudnick, Addonizio, Pappa & Casazza represent clients injured because of negligence in Hazlet, Middletown, Keyport, Union Beach, Holmdel, Red Bank, Monroe, Rumson, Asbury Park, Highlands, Atlantic Highlands, Leonardo, Sea Bright, Monmouth Beach and throughout New Jersey. Call 732.264.4400 or email us to schedule a free consultation about your case. We have an office conveniently located at 197 State Route 18 South, Suite 3000, East Brunswick, as well as offices in Hazlet.